Gary Warby, Director Premier Windows and Doors, helps us understand the importance of having adequate ventilation in our homes. According to a recent poll by Ipsos MORI for the Energy Saving Trust, 44 per cent of people said they lived in a draughty home, 38 per cent complained of condensation problems in their property and 29 per cent said they had mould. This neatly sums up a common problem for homeowners. We insulate and fit double glazing to keep our homes warmer and to eliminate draughts but in doing so we can also create a moisture and condensation problem. Condensation is much more about how we live in our homes than anything else. But adequate ventilation also plays an important part. It may sound counter-intuitive but as well as making sure that your home is warm, it’s really important to make sure that it’s ventilated. 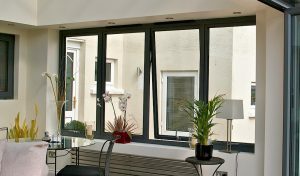 At a base level, windows are obviously there to be opened and regularly doing so, will help to release the water vapour, which builds up in the air from every day activities. But in reality, you don’t always want to leave windows open. In cold weather, there’s very little point spending money on insulating your property, only to let warm air escape by leaving windows open. Trickle vents are ideal. They can be left open to provide continuous background ventilation, ensuring circulation of air and avoiding build-up of condensation without allowing your homes to become cold. So what are they and how do they work? Well there are three types of trickle vent – through frame, over frame and glazed-in. Glazed-in ventilation sits at the very top of the double or triple-glazed unit, while over-frame routes ventilation over the top of the frame into the property. Technically there is no specific requirement to install replacement windows with a trickle vent unless there was one there previously. Where this is the case Building Regulations stipulate that as a minimum, the new trickle vent must provide the same amount of ventilation as the one it’s replacing or 5000mm2 EA per habitable room. Good window installers should be able to talk you through the options.